Recooty ranks the top applicant tracking system list for small and medium enterprises by Software Advice. An Applicant Tracking System is software whose basic function is to electronically automate the job posting on multiple job boards, filtering applications, shortlisting, interview scheduling and hiring process. To create this report, Software Advice evaluated over 320 Applicant Tracking System (ATS). Only those with the top scores for Usability and User Recommended made the cut as FrontRunners. 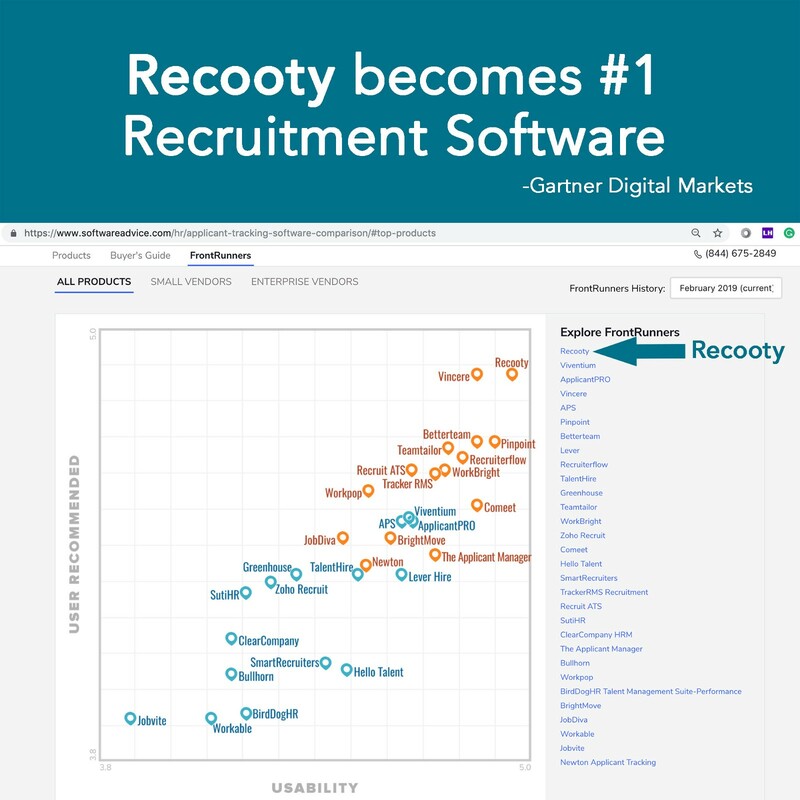 Out of all Global Recruitment Software products reviewed by Software Advice in 2019, Recooty scored highest 4.9 out of 5 and emerged the clear recruitment applicant tracking system market leader based on verified user reviews and ratings. Vendors include Recooty, Workable, Taleo and more. Post Jobs, review applications, shortlist candidates, schedule interviews and hire all at one place- Recooty. Recooty is an all-in-one recruitment tool(ATS) which helps small and medium enterprises in building their great teams. It optimizes recruiting right from the initial stage and streamlines it to the very end of the hiring process. How has Recooty become the global recruiting software leader for SME’s? Recooty has become the global leader because of its simplicity, this tool is extremely easy and is very affordable. You can start posting jobs in minutes using this tool, track applicants and acquire great talents easily. Hiring should be easy and affordable, every organisation deserves a better team to achieve their goals. Our mission at Recooty is to help SME’s in building their great teams- says Avdhesh, the Co-founder of Recooty. Software Advice is the leading online service for businesses navigating the software selection process. Advisors provide free, personalized software recommendations, helping companies of all sizes find products that meet their business needs. Software Advice also features objective research by industry experts and reviews from validated users, saving buyers time and resources. Software Advice is a Gartner company.